Outlander is one of Starz's all-time biggest hits, and Sam Heughan is at the heart of it. He has audiences and critics swooning for his performance as 18th century Highland warrior Jamie Fraser, who becomes involved with time-traveling nurse Claire Randall (Caitriona Balfe). And now, according to Gold Derby's exclusive Golden Globes predictions, Heughan has a great shot of translating all of that love and support into his first-ever nomination. This international TV sensation ticks a lot of boxes for Golden Globe voters. Remember, these awards are given out by the HollywoodForeign Press Assn. That's key because the people voting for the Globes love to trumpet new hot stars like Scottish-born Heughan for their media outlets across the world. 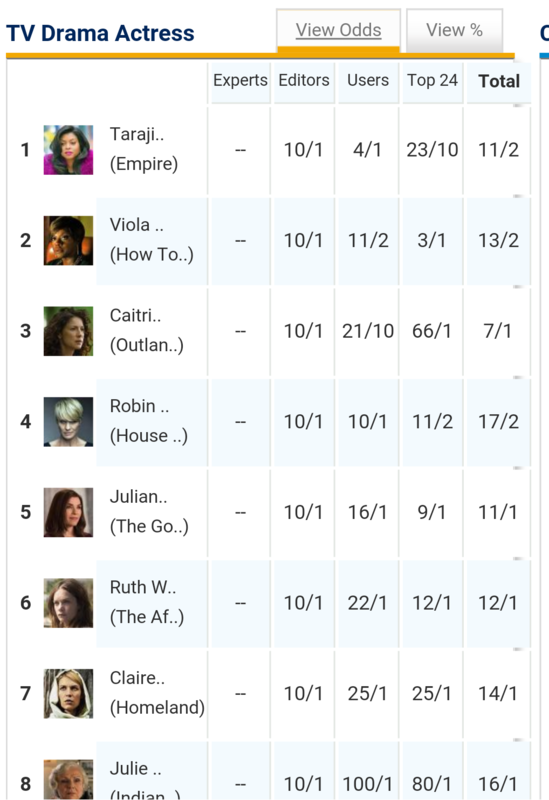 Based on our Golden Globes rankings, Heughan is in second place to win TV Drama Actor behind only last year's champ Kevin Spacey ("House of Cards"). To compare, last year at this time Heughan was only in our11th place position to receive a bid, indicating increased support. While Heughan was snubbed last year, it's important to note that the second half of the first season (which aired in early 2015) received much better reviews and was heralded by critics. If Globes voters are paying attention, he should be a shoo-in for a nom. As of this writing, Spacey has leading 11/2 odds to win, followed by Heughan with 7/1 odds, then Jon Hamm ("Mad Men") in third place with 8/1 odds, Terrence Howard ("Empire") in fourth place with 9/1 odds and Rami Malek ("Mr. Robot") in fifth place with 11/1 odds. 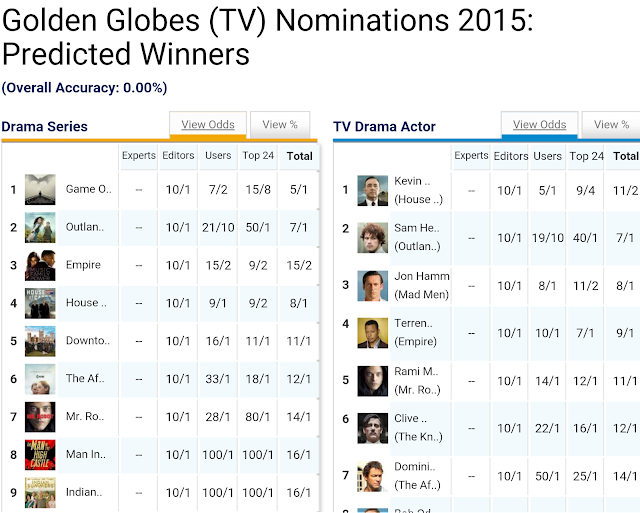 See more up-to-date Globes odds and rankings right here. Starz has had great luck at the Golden Globes in recent years with notable wins for Kelsey Grammer("Boss") and Jacqueline Bisset ("Dancing on the Edge"). They've also earned nominations for Frances O'Connor ("The Missing"), Chiwetel Ejiofor ("Dancing on the Edge"), Rebecca Ferguson and Janet McTeer ("The White Queen"). Hopefully they'll continue to rise!